to senior American government officials." Most interesting is the large amount of lithium, which will be an important resource as we move to hybrid cars. However, it will take decades before they have the engineers and the technology to actually tap these resources. The big question is whether this is a good thing or a bad thing for Afghanistan. 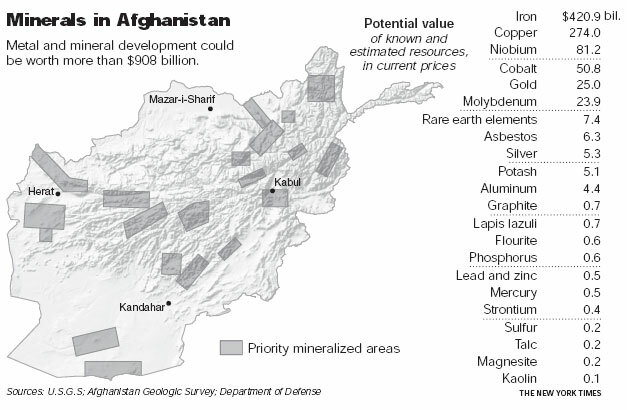 If the Taliban controls those mineral deposits or a Russian-style mafia forms, then big trouble. Hopefully, it will raise the standard of living and increase education in this state. Either way, there's no way we're going to leave this country for a long, long while. Next > Do We Support All the Sisters? It’s a terrible thing, unless they diversify their economy. Reliance on natural resource commodities is a sure way to authoritarianism and corruption, with an underperforming economy. Opium *and* lithium. What’s not to like?